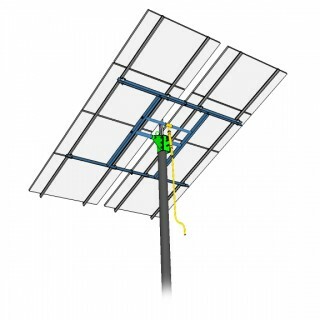 MT Solar's 6-TOP-8-60C TPM Complete Kit for (8) 60-cell solar panels is designed and field tested to be installed by one person, without having to set parts in the mud or lift anything overhead. This unique system is designed to be assembled at the waist level and then hoisted as high as necessary from the ground. This eliminates the need for a crane or scaffolding and minimizes overhead lifting and working from a ladder. 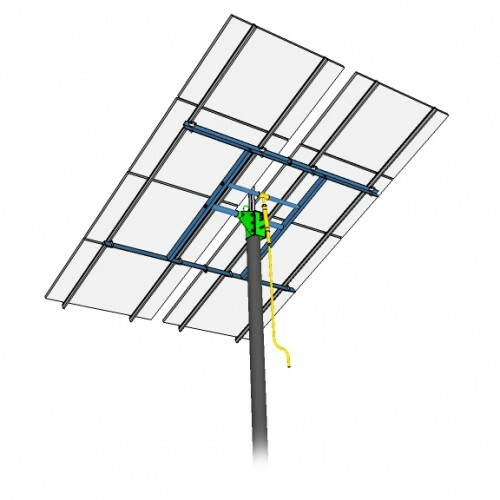 Once the array is installed, you can easily adjust it by hand from the ground for fast and safe seasonal tilt and snow removal ranging from 5 to 90 degrees by using their screw adjuster with handle. The standard frame mounts on an installer supplied 6" SCH 40 or SCH 80 pipe - thickness determined by design loads and distance from ground. It is engineered for a 105 mph wind load and 50 psf snow load. If your site conditions exceed these loads, contact us for a custom quote. The kit also includes beam to rail clamps, heavy duty aluminum rails and necessary mounting hardware for your modules, but you can also provide your own since they will work with many other manufacturer's available on the market today. Finally, a pole mounting solution that makes sense, saving time and money.